Damian Villa is part of an exclusive cluster of 5 newly constructed villas, located in the cliff-side of the traditional village of Roussospiti, just 7 km from Rethymno town and few minutes away from all major beaches. 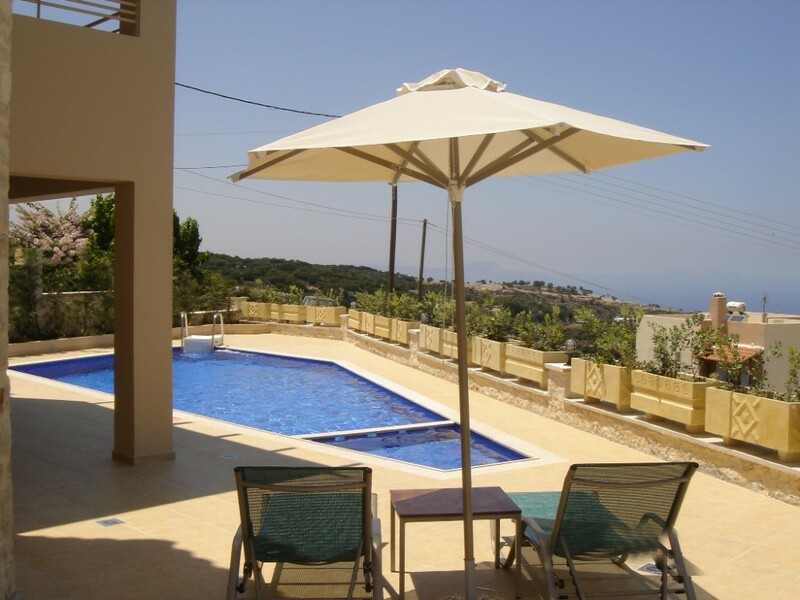 The villa is blessed with supreme location overlooking a breathtaking gorge and a most impressive sight of the northern coast of Crete. The outstanding view extends to the infinite sea blue, from Chania's Suda bay on the west to Psiloritis Mountain on the east. The panorama centers on Rethymno, its port, the Venetian fortress and the minarets. The complex is surrounded by rich Mediterranean grounds and pine forests that provide outmost tranquility and maximum privacy. The rural setting, full of olive trees and local flora is perfect for walking, trekking and cycling. The villa is equally attended and equipped in order to meet the highest standards. A personal 40 m2 mosaic tile pool with ample sunbathing terrace is provided and the property is surrounded by private garden, sheltering a stone patio with barbeque grill. Airy verandas and balconies provide amazing views of the island's natural beauty. Elegant living room with cozy fireplace, satellite TV, DVD and hi-fi system along with spacious dinning area and fully equipped kitchen indicate Damians top quality. All bedrooms open into a private balcony and have their own private bathroom. The queen-size bed master bedroom include en-suite bathroom with whirlpool bathtub. Cleaning services are provided twice a week and pool attendance along with garden maintenance on a daily basis. Within walking distance, there are shopping facilities and traditional tavernas which serve delicious Cretan specialties.